Take a ride on Ripley's Big Red Christmas Train for a "lightseeing" tour of St. Augustine’s Nights of Lights. Ripley’s Red Trains Nights of Lights tour provides a magical trip through St. Augustine’s beautiful Nights of Lights celebration. More than three million holiday lights twinkle in St. Augustine's historic district during the Nights of Lights festival, which has received world-wide recognition and acclaim as one of the best places anywhere to see holiday light displays. Relaxing aboard one of Ripley’s festive red trains for a "lightseeing" tour of the Nights of Lights, guests can delight in the special effects of their magical viewing glasses on the dazzling light displays, join in the holiday caroling, or just enjoy the company and the holiday spirit. The tour runs from November 18, 2018, through January 5, 2019 (excluding Christmas day), and on Friday and Saturdays only January 11 – 26, 2019. Hours are 6:00 to 8:00 p.m. Sunday through Thursday and 6:00 to 10:00 p.m. on Fridays and Saturdays. See below for prices. Additionally, on Friday and Saturday evenings from November 23 through December 22, 2018, Ripley's will host a free Christmas party on the grounds of the Believe It or Not! Museum, which is the departure location for the Red Trains Nights of Lights tours. There will be holiday movies, performers, balloon artists, face painters, gifts from Santa, and a giant marshmallow pit. Ripley's Red Trains Nights of Lights Tour offers a “no waiting” option with a reservation-based VIP tour that’s available only on Fridays and Saturdays. The price is slightly higher than the regular tour ($14.99 for adults and $5.99 for kids), but for those who want to avoid waiting in line it may be well worth it. Admission: Tickets for the Ripley's Nights of Lights Red Train are $11.99 for adults and $5.99 for kids. VIP tickets with reserved seating are available on Friday and Saturday nights only; prices are $14.99 for adults and $5.99 for kids. Combo options are available for the 2018-19 season as well. The Combo Ticket (includes Nights of Lights Train, a one-day Red Train Pass, and a round of miniature golf at Bayfront Mini-Golf) is $30.99 for adults, $14.99 for kids ages 5-11, and $5.99 for kids ages 3 to 4. The Super Combo Tickets (includes Nights of Lights Train, one-day Red Train Pass, Mini-Golf, and ticket to Ripley's Believe It or Not! Museum) is $44.98 for adults, 22.98 for kids ages 5 to 11, and $5.99 for kids ages 3 to 4. The Nights of Lights Museum Combo includes the Nights of Lights tour and admission to Ripley's Believe It or Not!, and is $23.98 for adults, $13.98 for kids ages 5 to 11, and $5.99 for kids ages 3 to 4. 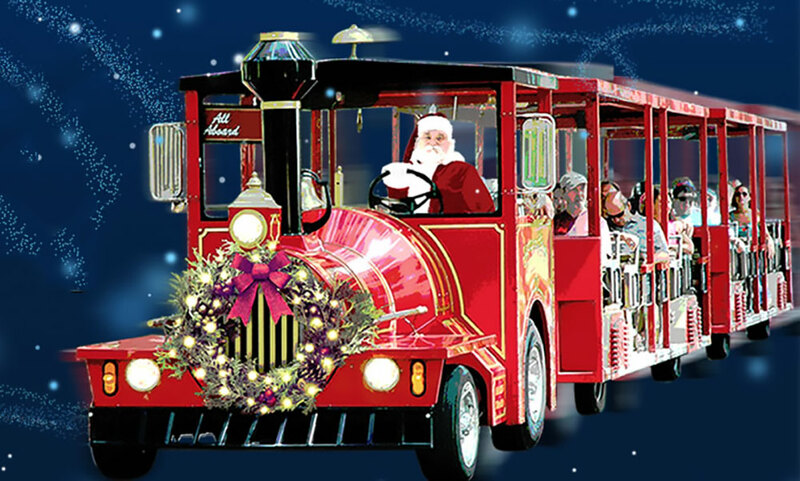 When: Ripley's Red Train Nights of Lights tours go out nightly, beginning on Sunday, November 18, 2018, and continuing through January 5, 2019, with the exception of Christmas Day. The tours will continue on Fridays and Saturdays only January 11 – 26, 2019. Tour times are from 6:00 to 8:00 p.m. Sundays through Thursdays and from 6:00 to 10:00 p.m. on Fridays and Saturdays. Where: Tours depart from Ripley’s Believe It or Not! Museum at 19 San Marco Ave. in St. Augustine. Call (904) 824-1606 or visit here for more information.